C’mon, Who Really Wrote it? : Alistair Hunter in 1963. 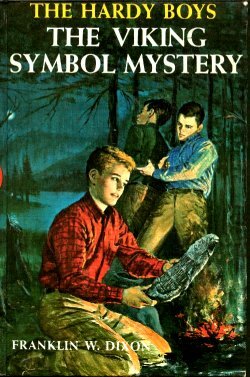 His only original Hardy Boys book, but written in the same year he revised 5: HUNTING FOR HIDDEN GOLD and the year after he revised 3: THE SECRET OF THE OLD MILL. I gave #5 a rating of 5 and #3 a rating of 6. Can Mr. Hunter get a 7 at last? Cover: Rudy Nappi. Red and yellow, with a mostly realistic setting. Good, classic look. Setting: Bayport and then Canada. Edmonton and Great Slave Lake in the Northwest Territories. Come see Canada! Where’s Fenton This Time? : He incites the action by getting Tony and Biff to go one way, and the boys and Chet to go another way, and then he joins in midway through and continues with the gang. Which Chums Show Up? : Chet, Biff, Tony, but it must be said that Tony disappears and Biff is used sparingly. But at this stage Mr. Hardy is using them all as cheap labor. What’s Chet’s Hobby This Time? : Nothing. Aunt Gertrude’s Dessert: Chocolate cake, not to mention “juicy, tender roast beef, buttered baked potatoes, fresh asparagus” before that. Aunty is on her game in this one. Plot: An old slab of rock goes missing that, wouldn’t you know, tells how to find a missing treasure if you can only read the Viking symbols. A gang is trying to read it, and the Boys have to stop them. Review: Not bad, though I never want to hear “Bon tonnerre!” ever again. But hey, Caribou Caron is a stand up guy, so I’ll forgive him for that. This one has an awful lot of flying back and forth between the lake and Edmonton. And they are constantly catching members of the gang and locking them up, until the whole book seems like a catch-the-next-guy story. But it has nice adventure, with bears and salmon and pesky insects, so readers will get a feel for the Canadian wilderness. And the story has enough suspense to keep you interested along the way.